Don’t miss out on the richness and depth of Passover – TAO style. It’s a wonderful chance to savor the joys of Pesach at the mystic level of understanding with your family and your TAO family. This is an experiential evening that will teach and encourage all who attend to share the holiday of Passover with joy, meaning and spirituality. Rabbi Marc will lead us through the rituals and traditions of making Pesach for your family in our uniquely TAO way. Be a part of this wonderful family evening of meaningful ritual, wonderful food and community. Reservations are open now and limited to the first 80 due to seating limitations. $20 for member’s guests and all non-members. Share the joy…bring a friend, your children and grandchildren! We ask that you try to honor Passover Kashrut by not including any foods or food products which contain ingredients derived from: fermented cereal grains: wheat, barley, oats, spelt or rye OR legumes such as corn, beans, peanuts, as well as rice. 1. 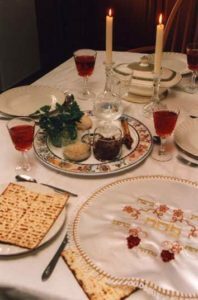 If you are hosting first seder and have room at your table for a TAO member with nowhere to go, please call the office and do the mitzvah of hosting. 2. Once again we will be hosting Holocaust Survivors at our Seder. If you are able to bring extra food to share, that would be great.